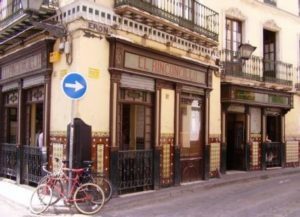 El Rinconcillo literally meaning the inside of a little corner takes its name from being situated on a corner of the adjoining roads Calle Gerona and Calle Alhondiga located near Plaza los Terceros. 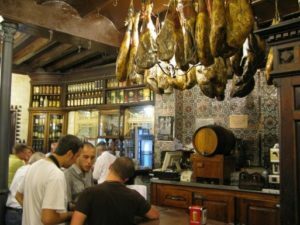 Established in 1670 it is the oldest bar in Seville and is frequented by tourists and locals alike. It has even started to attract some famous celebrities, the most recent visit being made by Harrison Ford and his partner Calista Flockhart. 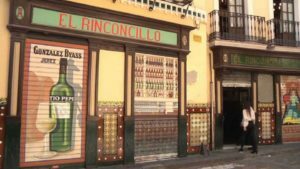 However, it still has an air of mystery as it draws the tourist away from the main centre of Seville towards a quieter more local barrio and unless you have read about it in a tourist guide you are unlikely to stumble across it. Now currently run by two brothers El Rinconcillo has been a family run bar since 1858 passing down from father to son and has been left untouched to keep it in its original condition. 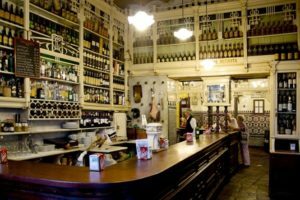 The walls are beautifully decorated in traditional Andalusian tiles and the carved wooden bar shows a wealth of history right down to the cigarette burns where people would have laid them down to take a sip of their drink. The bar has its old telephone on the wall which still rings even though it is not used and there is also an old telephone book hanging above which looks better for wear but adds to the overwhelming history surrounding you. When there, don´t forget to look up at the shelves of drinks, which cover floor to ceiling, again sharing the bars history, with the ones at the top being unique in that they are no longer made or exist except in this bar. Even the brewery that made them has been known to try and buy them back. You will notice upon entering that the bar has maintained other traditions in that no women work front of house. All the waiters and bar staff are men dressed in white shirts with black waistcoats and black ties giving an air of being smooth, suave and sophisticated gentlemen. Each barman seems to have their own unique character, some being chattier than others and some with the occasionally grunt being sufficient. However, they are good at what they do, sometimes being three people deep at the bar they are quick to serve your needs and once you are known to them your drink is often waiting for you before you even make the order. Get ready to practice your Spanish though, as their English is limited and you´ll be left wondering if you will actually get what you asked for adding to the whole experience. 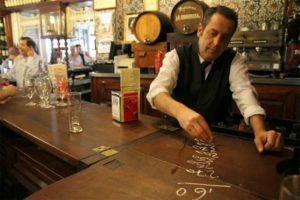 Once you have ordered your drinks and tapas they charmingly write your bill on the bar with chalk which often becomes a challenge to us foreigners to see how long we can make it. This allows them to show off their mental arithmetic skills at the end of the night when they have to add each up separate round all together. 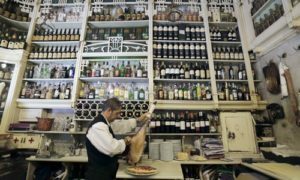 Considering it is the oldest bar in Seville, El Rinconcillo´s prices have remained reasonable, a small beer costing the standard 1.20 euros and the tapas ranging from two euros to five euros. There is a good range of traditional Spanish tapas on offer such as croquettes, cheese, chorizo, spinach and chickpeas to name a few but you can´t leave without trying a plate of their Iberian ham. 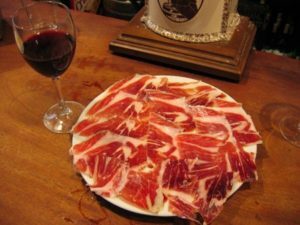 The Iberian ham, iconically hanging over the bar waiting to be used, is of the highest quality which is reflected in its price of 9 euros a plate. However, the experience is worth it; the whole procedure of ordering a plate of ham is an art form within itself, from the ham being brought down from the ceiling, the first cuts of the ham to the fine precision of slicing it into little pieces and carefully being laid out on the plate to be presented. Better still is the taste, as once put on your tongue, it melts away into your mouth, leaving an authentic taste of Seville. Besides being a tapas bar El Rinconcillo boasts an impressive restaurant, with seating areas spread across three floors. Here you can have a sit down meal with table service, a sharp contrast to the standing tapas culture seen in the bar. The restaurant serves traditional Andalusian-Mozarabic meals using a variety of recipes which include fish, stews, seafood, meat, vegetables and desserts. Last of all, but certainly not least is that El Rinconcillo is open every day of the year except for two weeks in the month of August from 13.00 to 01.30am, making it a popular place to stop for a drink on the way home. Quite often if you do stumble across the bar at around closing time you will find yourself being shut in with the shutters coming down around you while you enjoy maybe a cheeky after hours drink. For a traditional Spanish experience, El Rinconcillo certainly should be on your list to visit during your stay in Seville.